Complications with the Shikimori slow our heroes briefly but give them a deeper understanding of the relationships extant between the Bandits, Merchants, Farmers and the Shikimori themselves. Combine it with the need to elude Bandit scouts, who have heard rumours of Samurai being hired to aid Kanna village, and our heroes have an interesting trip to Kanna. Once there they find the reception less than cordial. 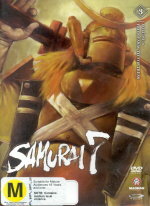 Here Kikuchiyo's past comes to the fore and he proves crucial in letting the samurai and farmers understand each other. Largely transitional this volume deals with the neccesary issues of getting the heroes intact to Kanna and how this unusual band convinces the farmers that not only are they there to help but that there is a chance to win the fight. It is very much setup for the next volume which will deal with the fight itself for the village. But it is nice to see a largely underutilised character shift from his usual comic relief schtick and become a valid member of the team of seven. I refer of course to Kikuchiyo who has thus far been more of a hindrance and largely bumbled his way through the story. Here his experience is vital and it is nice to see the character have a serious side. The other character development of note is Katsuhiro who is rapidly begining to understand the true costs of being a samurai. By volume end he is forced to grapple with the ugly reality behind the noble concepts and I am not entirely sure he likes what he has discovered. it is going to be interesting to see how he develops over future volumes. The stage is now set for the arrival of the oft referenced but infrequently seen Nobuseri.